Little-known Fern Canyon, located in Prairie Creek Redwoods State Park north of Orick, was a highlight of a trip my husband and I took along northern California's coast. The canyon is about 5 miles from the park's visitor center via a bumpy dirt road (no vehicles wider than 8 feet wide or longer than 24 feet allowed). We hiked along the road, marveling at the soaring redwoods, hemlocks, and Sitka spruce. Spurred by the sounds of a babbling waterfall, we entered the narrow canyon. 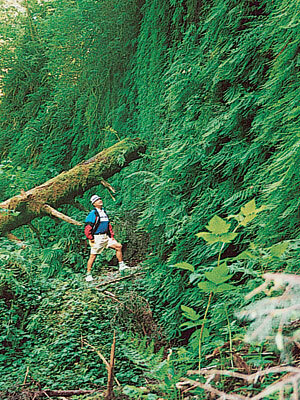 Its 40-foot-high walls are covered with extravagant green ferns. Dense flowers and moss carpet the ground. It sure was spectacular–and the Pacific Ocean is just a 1/2 mile farther! The park adjoins Redwood National Park. The visitor center (127001 Newton B. Drury Pkwy. ), located just west of U.S. Highway 101 and about 6 miles north of Orick, is open from 10 a.m. to 4 p.m. daily (9 a.m. to 5 p.m. March through October). For more information, call 1-707-464-6101, extension 5301.